Beautiful, clever, rich—and single—Emma Woodhouse is perfectly content with her life and sees no need for either love or marriage. Nothing, however, delights her more than interfering in the romantic lives of others. But when she ignores the warnings of her good friend Mr. Knightley and attempts to arrange a suitable match for her protégée Harriet Smith, her carefully laid plans soon unravel and have consequences that she never expected. Q: When we celebrate the 200th anniversary of EMMA, what in particular are we celebrating? What’s new about this edition? A: We’re celebrating the 200th anniversary of Emma’s original publication, in London in December, 1815. The date of publication is a little confusing because “1816” was printed on the title page of the first edition of the novel, but it was actually released in December, 1815. I think this gives us the right to celebrate for a whole year! Q: In the Austen canon, what would you say makes EMMA special and unique? A: Emma is special because it’s the capstone of Austen’s career as an author. She had already published three novels (Sense and Sensibility, Pride and Prejudice, and Mansfield Park), and she was at the very top of her game as a writer. She didn’t know it, of course, but Emma would be the last book she saw through to publication. When Austen died in July 1817, she left two essentially completed novels (Northanger Abbey and Persuasion), which her brother published at the end of that year. So Emma is the last Austen novel that was published in the exact form that she herself approved. Q: What was the publishing process like when EMMA was first published? How was the novel received critically? Was Austen as popular in her own day as she is today? A: The publishing process was recognizable in some ways and very different in others. Austen didn’t have a literary agent; at that time, authors dealt directly with publishers. With Emma, she chose a new, more prestigious publisher—John Murray—than she had used for her three earlier novels, and she negotiated hard for a good contract with him. As authors are today, Austen was responsible for proofreading and approving copy before publication. Since being a published author was considered not so respectable for an unmarried woman, Austen chose to remain anonymous on her title pages throughout her lifetime. Emma identifies her as “the author of Pride and Prejudice.” Her identity wasn’t made publicly known until after her death. Q: One of your specialties as a professor of English is how Jane Austen’s work continues to appeal to people, how it remains at the forefront of pop culture conversation. Last year, Alexander McCall Smith updated EMMA, “Pride and Prejudice and Zombies” hits the big screen in 2016, and movie and TV versions of Austen continue to draw viewers. Why do you think we keep updating and adapting Austen? What are your favorite adaptations or updates, and what makes them successful? A: Austen really is endlessly adaptable, much like Shakesspeare! You can transpose her stories and her characters to other places and times, and they still work. My own favorite creation inspired by Austen is Amy Heckerling’s Clueless, from 1995. Clueless is a joy to experience, and smart too, much like an Austen novel. Q: What is it like to prepare a new edition of a book that’s so well-known and exists in many editions? What kind of research did you do? Did anything you learned during the process surprise you? A: It was really important to me to create a truly new approach to —a welcoming, reader-friendly approach. Excellent editions of Emma already exist for scholars and for devoted “Janeites.” With this anniversary edition, I wanted to open Austen up to people who hadn’t given her a try before, and to support their reading experience by using everything I know from years of teaching undergraduates and from talking with everyday readers. I certainly reached for plenty of scholarly and reference sources on my shelves, but I’d say my most important preparation was to have built up, over time, a sense of what readers are curious about and what frustrates them in their first encounter with an Austen novel. And, through my teaching, I’ve had a lot of practice at explaining historical concepts in an accessible way. 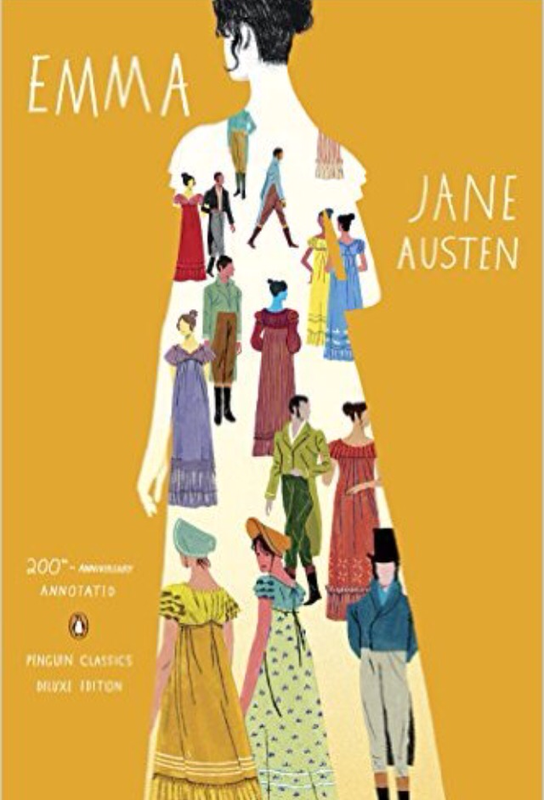 Q: The illustrations for this edition are drawn from historical copies of Emma in the Jane Austen Collection at Goucher College, where you teach. Can you tell us more about that collection? What is it, exactly? Q: As a college professor, what’s your favorite aspect of teaching Austen? Do you face any challenges in interesting students in her writings? A: Absolutely the best part of teaching Austen is that so many students are enthusiastic about studying her writings. She is an easy sell! Shakespeare is the only other English writer who has a draw like hers. And Austen has the advantage that her life story as a woman writer is especially appealing. Many of my students are creative writers themselves and find Austen’s confidence and perseverance to be very inspiring. Q: Do you think we have a modern-day equivalent of Jane Austen? Or do you have any “further reading” suggestions for Austen fans who’ve read all of her books a thousand times and are looking for something new? A: I love to read contemporary novels and memoirs, and I always keep an eye out for hints that an author is influenced by or interested in Austen. I recently re-read Allegra Goodman’s novel The Cookbook Collector and really appreciated how she weaves in elements from Emma as well as from her more obvious place of inspiration, Sense and Sensibility. I also particularly like that Alison Bechdel, author of the graphic-format memoir Fun Home and the Dykes to Watch Out For comics, gives several shout-outs to Austen. Flyover Lives, Diane Johnson’s hybrid family history / memoir, includes a fascinating account of what Johnson’s foremothers in America were up to at the same time that Austen was writing about much more privileged women in England. Giveaway: Penguin is letting me give away a copy of this 200th anniversary edition of Emma. Leave a comment with your email if interested. This entry was posted on September 30, 2015, 06:12 and is filed under Books. You can follow any responses to this entry through RSS 2.0. Both comments and pings are currently closed.